I uploaded two new products to my TpT store today. Click on the pictures to download a preview of the products. This drama activity with a general theme has a similar format to the "I Have / Who Has" game. This is a fun any day activity. There are 40 cards, that follow in a sequence, with each card having a different instruction. Students assemble in a circle to perform their scenarios. 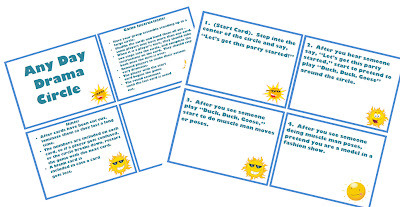 As each student finishes acting out his or her card, the student with the next card in the sequence starts acting out his or her card. The game continues until the last card is acted out. 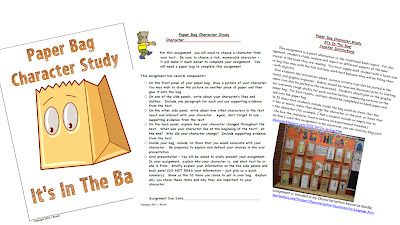 This assignment is a fun alternative to the traditional book report. Using a paper bag, students draw a picture of the main character, report on his or her likes and dislikes, and interactions with other characters, and analyse how the character has changed throughout the novel. Inside the bag, students include 10 items that are related to the character. A version of this resource is included in my Characterization Resources for Language Arts and Literary Elements Resource Binder. Lastly, I read a great article on the Teacher2Teacher Blog today - 10 Tips for First-Year Teachers. If you are a first year teacher, or just got your own classroom, you really need to go over and check this one out. Love this! My kiddos are obsessed with ipads, and since our school has them - we're going to be checking out some of these sights tomorrow while filling out your free google doc. Thanks so much for giving us a fun, yet educational activity for homecoming day!